Welcome to the five hundred and fifty-ninth of my blog interviews with novelists, poets, short story authors, biographers, agents, publishers and more. Today’s is with portal fantasy author and spotlightee Jinn Nelson. A list of interviewees (blogged and scheduled) can be found here. If you like what you read, please do go and investigate further. Morgen: Hi Jinn. Can you tell us please a little about your writing. Jinn: I write about what interests me the most. Usually, what interests me turns out to be stuff that doesn’t exist in our world. When I first started the journey to getting published, an author asked me what I write. I told them, stories about other worlds. They said that put me in the ‘portal fantasy’ bracket. Portal fantasy writers, apparently, are a special breed. Morgen: I think you’re the first I’ve interviewed. 🙂 What have you had published to-date? Do you write under a pseudonym? 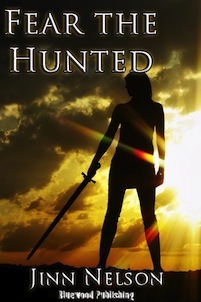 Jinn: Fear the Hunted is my first published novel. I write under a nickname, technically a pseudonymn. I started writing a character collaboration with a small group of friends I met on the internet, and my character’s name was Jinn. Eventually, somehow, it became my nickname, which trickled over into ‘real life’. Now more people call me Jinn than don’t, which suits me fine. Nelson is my real last name. Morgen: 🙂 Is your book available as an eBook? Jinn: It is available as eBooks on all platforms. I’m excited to be involved in the ebook development, and I want to learn how to format epub just to know how it’s done. I’ve been watching the Rowling ebook initiative with interest, though I’m nowhere near ready to pull off something like that. In the future, though, who knows. The industry is still developing, so what’s ‘new’ or ‘normal’ today will be different next year. My focus right now is to learn, unlearn and relearn as fast as possible to keep up. Morgen: We are certainly being kept on our toes. What point of view do you find most to your liking: first person or third person? Have you ever tried second person? Jinn: The first story I wrote was in first, second and third, in no particular order. The story didn’t get much publicity. Then again, I was eight, and I hadn’t studied points of view much. I think they’re all useful for different things, and I like to explore. Besides creating characters, exploring points of view is probably my favorite thing about writing. Morgen: It’s great, isn’t it. I especially love second person although it’s an acquired taste. Do you have a method for creating your characters, their names and what do you think makes them believable? Sometimes I fill out detailed profile sheets, sometimes I just record a character journal. Morgen: Profile sheets are great. I use them in my writing workshops. Do you have a favourite of your books or characters? Jinn: In Fear the Hunted, one of my favorites is D’tanesse, a young performer searching for his lost cousin, who struts around in garish outfits and wears a coat with pockets stuffed with explosive powders. The first time I met him in the story, he was walking on his hands around a bonfire, muttering to himself, and I knew he was going to be fun. Morgen: Oh I like the sound of him. 🙂 Having lively / quirky characters is half the… er, fun. 🙂 Do you manage to write every day? Do you ever suffer from writer’s block? Jinn: I do. The most repeated advice from the authors I emulate is to write every day. It’s also the most effective deterrent of writer’s block. Even if I have nothing to say, I write nonsense until something resembling a sentence forms. When it gets really bad, usually because I’m scared because I don’t know what’s going to happen next or what the characters are thinking, I watch Elizabeth Gilbert’s TED talk on genius, or read a quote from A Moveable Feast: “But sometimes when I was started on a new story and I could not get going, I would sit in front of the fire and squeeze the peel off the little oranges into the edge of the flame and watch the sputter of blue that they made. I would stand and look out over the roofs of Paris and think, ‘Do not worry. You have always written before and you will write now. All you have to do is write one true sentence. Write the truest sentence you know. '” Then I get out the paper and I write one word at a time. Morgen: Freewriting is great. Your brain will get bored eventually and kick in. What are you working on at the moment / next? Jinn: The next story is one I’m really excited about, in which one fictional country (similar to Russia) is about to take over another country (similar to Eastern Europe). A soldier named Areli Rubin, a young woman using her military commission to support her disabled mother, is sent out with a small unit—a cross-dressing spy, a bipolar captain who imagines everyone he meets is a shapechanger, and a draconic prisoner of war who may be her only real ally—to kill the leader of the last resistance group. If she fails, she’ll be executed for treason by her country, or tortured to death by the enemy—that is, if one of her own group doesn’t get her killed first. It’s the first book of a series, leading to a much larger story. This one sets up some basic elements of how Areli’s world works and introduces some characters who are important later on. Morgen: Wow, you do have a great imagination! Thank you, Jinn. 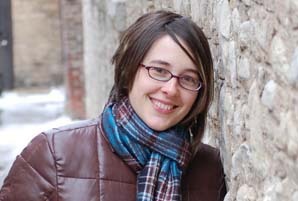 Jinn Nelson started writing fiction at age seven, on a computer with a screen bigger than she was. She sat down one night, without any clear goal in mind, and wrote a heartwarming story about two sisters finding the perfect gift. She wrote it in multiple points of view and in all three persons. At sixteen, she wrote the first draft of Fear the Hunted while also studying medical transcription. After high school, she married and lived quite happily in northern California, a self-employed medical transcriptionist until she met a group of writers online and began writing fiction again. Her first published novel, Fear the Hunted, was published in early spring, 2012. She lives and writes in Wisconsin with her husband and three cats. She is a voracious reader, particularly of Celtic mythology, Steampunk, and portal fantasy. She also enjoys knitting, rock climbing, loose-leaf tea, zombies, dancing, and the Internet. Her favorite country is Scotland. Her website is www.jinnnelson.com, blog www.jinnikins.wordpress.com and you can find her on Twitter as @jinnm. You can also read my author spotlight of Jinn here.